we are using two instances of 5.7.20-18-log (in the meantime updated to 5.7.21-21-lo) Percona Server in a master-master (dbm1 / dbm2) replication. The application only uses dbm1 for writes and reads so the dbm2 is used as a cold standby only. 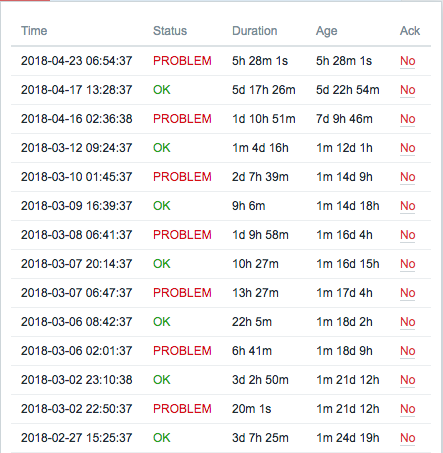 Since a couple of weeks the replication on dbm2 stops multiple times per week with the error message "unknown error reading log event on the master". Generally we address this with a full restore of dbm2 with XtraBackup but after a few days the problem on dbm2 appears again. As we can see in our monitoring, both servers have enough resources left (and no IO-Wait) - what we can see is, that this often happens when the application is doing some import jobs. Both servers are located in the same datacenter, communication via the internal network. Any Ideas on how to mitigate the root cause for this type of replication error? [OK] /var/log/mysql/error.log doesn't contain any error. [!!] thread_pool_size between 16 and 36 when using InnoDB storage engine. [!!] This replication slave is running with the read_only option disabled. [OK] This replication slave is up to date with master. innodb_buffer_pool_size (>= 12G) if possible. innodb_log_file_size should be (=1G) if possible, so InnoDB total log files size equals to 25% of buffer pool size. [--] This server is acting as master for 1 server(s). [!!] This replication slave is not running but seems to be configured. Unfortunately iostat does not work inside of OpenVZ containers. Just to be on the safe side I increased the RAM on both containers from 16GB to 20 GB. Both are operating with GTID_MODE=ON (we use GTID_MODE=OFF) and are facing totally different error message in the slave status. Please spend 2 minutes at MySQLCalculator.com to recognize the extreme RAM footprint your current my.cnf-ini variables would require. Only 16G available. Also, please post complete Mysqltuner report that will include version of MySQL you are using, by ENGINE data space used and table counts, cache utilization, threads created and other helpful information. Please post complete results of A) ulimit -a so we know the limits your OS are working with and B) iostat -x for extended IOPS read/writing to your drives when busy.